Diet Earth is a revolutionary change in the thinking of human nutrition. The human being has been living off the Earth ever since the beginning of man?s first breath. The Earth is designed to provide all the vital nutrients animals need to live by. However, due to the development of industrial factors and processed food, the vital nutrients of Earth are being compromised. Illness, organ disease, cancer, psychological disorders, and obesity are growing in astronomical proportions. All of these situations are a direct result of poor nutrition, processed foods, and the depletion of the Earth?s vital nutrient supply. Daryl Conant teaches methods in how to eat, when to eat, why we need to eat and how important it is to eat raw nutrient rich organic foods. diet EARTH discusses the reality about nutrition and how food works in the body. After reading diet EARTH you will have a greater understanding of the purpose of nutrition on Earth. This book is not a diet, it is an instructional guide on how to eat, when to eat, what to eat and why we need to eat. 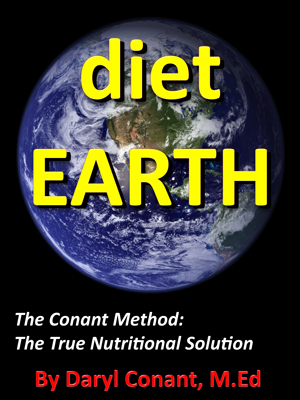 Diet Earth is a great resource of complete intelligent nutrition for the ages. A must have for anyone serious about nutrition and being fit.